What the Oregon Trail pioneers crossed the continent to find. The Willamette Valley contains the earliest permanent American settlements in Oregon. Stretching from south of Eugene to the falls at Oregon City, it was the promised land for many of the emigrants on the Oregon Trail. The fertile valley is the agricultural heartland of Oregon, with a tremendous variety of crops being grown. The two dominant educational institutions--Oregon State University and the University of Oregon--are both found in the Willamette Valley. 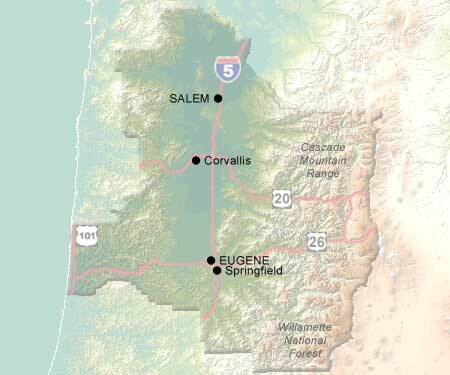 This is also the largest center of population in Oregon outside of the Portland Metropolitan Area.